Controlled Release contains Garratt-Callahan’s proven, effective formulas, but in a concentrated and newly improved solid form. This will provide the same scale and corrosion protection for cooling towers as traditional liquid formulas, but with some unbeatable benefits. Garratt-Callahan Controlled Release products incorporate several aspects of the U.S. EPA Green Chemistry Guidelines. The products are inherently safer to handle, less hazardous, and low in toxicity. Less fuel is used in transporting the products and drum disposal is eliminated. Controlled Release technology can reduce the environmental impact, and resolve safety issues. With your chemicals in solid form, you’re less likely to have spills or leaks to worry about. 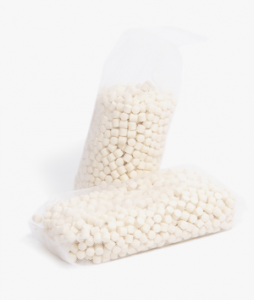 The pellets are completely safe to handle, and you won’t have to dispose of any hazardous materials when the pellets are fully spent. One Controlled Release dosage lasts for a full 30 days, making the treatment program extremely easy to manage. Plus, there are no chemical pumps or moving parts to repair or replace, and once the formula is used up, you won’t have to deal with the removal of empty drums. Controlled Release is easy to deliver and can be sent to you via standard or express shipping methods. Is your tower in a difficult-to-reach location where rooftop access, high ladders, or hatches are involved? Controlled Release is compact and light, making it safer and easier to transport to these hard to reach locations. © 2019 Garratt-Callahan Company. All Rights Reserved.